It’s blog cruise time again!!! hmmmmmm …. well, I would have to say that most of my homeschool goals this year will revolve around the younger two. They are Pre-School and 4th grade. The big kids ( a Senior and Junior ) are moving on and their goals are becoming ones they set….. which is hard to get used to…. but I am adjusting….maybe. For my Pre-Schooler, Jeremiah, I am looking to see him be able to write his name independently, and with lower case letters. I also want him to be able to recognize all of the letters of the alphabet and their sounds. He is currently helping his brother learn his multiplication tables, and I think that we might be able to get some addition facts glued into his brain as well. Hunter, my 4th grader, is getting a reality check this year. Expectations have gone up, and the real work has begun. For him, we want to have cursive licked by this year. A solid grasp on his multiplication and division facts memorized to 12. We need to see an improvement in penmanship so that he doesn’t write like a serial killer, along with an improvement in the fluidity of reading. He struggles with spelling so we take that area slower for now but the goal is to begin to see marked improvement in that area this year as well. My personal goal for this year is CONSISTENCY!!!!!!!!!!!!! sometimes I get too relaxed with school. I have to quit that. So my goal is to be consistent and get work done every day. I struggle with reading aloud the work that needs to be done with him, and he has struggled to read it on his own…. so we skip things if I don’t have the time to sit and read. My goal is to end that and just read what needs to be done, one day at a time. So there you have it, our illustrious goals for the year. What are your goals? I would love to hear what they are…. Have you written them down? I find that writing them down and putting them near something I see everyday helps keep me focused and on task. Visit the TOS Blog Cruise ( Post will go live OCT 11th.) and see what goals other homeschoolers are setting this year. Lawyers, Doctors, Divers and Cheeps…. oh my! Tayler, she is 15. She wants to be a doctor, paramedic, farm/ranch (a “franch” she called it..) owner, a missionary, and maybe a zoo owner. We encourage her by letting her keep Noah’s ark at our house…. She also helps out our friends with their farm work whenever she can. She knows how to vaccinate animals and clip pig teeth, and help goat babies come into the world. She is an amazing goat and pig wrangler… I have seen her chase a 300 lb pig and win. In her pursuit of medicine, she really likes to study how Herbs work in our bodies to help us naturally. She has mentioned becoming a doctor of natural medicine. For missions, we have been on a trip to Mexico, and I think our church will be going on another one in a year, so we will attend that also. If she wanted to move to a different country ranch alpacas, tell people about Jesus, and grow herbs to help treat sicknesses, at 17… I’d be ok with that. Jeremiah, my lovely 3 year old for only a few more weeks, proudly declared that when he grewed up he wants to be a “fyah cheep”. Fire Chief, I can do. We will start investigating all the fire truck we see when we are out running errands. Don’t forget to click on the big ship at the top, to check out what the kids of other homeschoolers want to be when they grow up, and how they are helping them be whatever God has designed them to be. ?Blog Cruise time again……… I was thinking last night in church ( wrong place to be day dreaming…LOL ) how a cruise on a real boat might be so much fun…. for now… cruising from the comfort of my spinney office chair will have to suffice. Well… lets see… starting from the top.. My Spouse. He is involved in our homeschool as the Principal. He solidly stands behind me in discipline issues, when needed. He has been known to leave work, on days that are especially difficult to help with some attitude adjusting. He also helps me with scheduling the children’s day… letting them know that is isn’t just mom making these “rules”. He is very artistic, and in the past he has taught our children an Art class in the evenings. He is also very mechanically inclined and repairs our own automobiles and those of people in our church. He models servant-hood, and teaches “shop” to anyone who wants to go and hang out while he is working. Back in the day when I was a working homeschool mom… My mom would do the kids work with them during the day when I had to work. At the time, I was a bus driver… she would do school on the days that I had field trips scheduled and would be driving all day. Most days, I could come home after the morning run and supervise, till the afternoon. Having her there to help the days I couldn’t be home were such a wonderful blessing. This happens most in our home as just a natural extension of the day. Lots of times I will just catch my daughter working on letters and numbers with her 3 year old brother. Sometimes she reads to him. Sometimes she teaches him words in Spanish. My sisters have helped too when we visit and are still schooling. Everyone really pitches in and wants to see the kids learn, and be successful. One of my sisters is the queen of fieldtrips. She is always finding fun places for the kids to explore when we visit. Ever seen a teacher that is Burnt Out? I remember them from my own school daze. In High School, they apathetically walked back from the teachers lounge with their cup of coffee, and flop down into their squeaky swivel chair with a sigh…. look out across the class, and just hope they can make it through the next hour with out mutiny. In Elementary School I have seen the burnt out teacher, happen as early as the first year. Ever seen a Kindergarten Teacher look like a scared cat? Those fast moving eyes, ever growing look of panic, praying that they don’t over run her…. Realizing that nothing they ever taught her in College prepared her for THIS!!??!! …. yeah, not pretty. Please, don’t get me wrong…. it doesn’t happen everywhere, or to every teacher. I think that teachers that avoid burnout, within the public or private school systems, have found out the key. They have found the joy of their job. They look for things to be joyous about. That morose high school boy, that just bared his soul in an English paper…. they are touched by the tenderness that was revealed. They rejoice over those “click” moments that happen when a student starts to read. They look for smiles, in the classroom and hallways, they look for ways to encourage, motivate and inspire. Not just collect a check. This translates over to we homeschool mom/teachers/doctors/cooks/housekeepers too. Practically speaking, I will say that changing up things that are a struggle, or moving around the times of the day that we do certain subjects, helps to keep us all from becoming bored. But, more and more, I find the key to not getting burned out is me, or rather my attitude. If I project apathy, it gets mirrored back. If I am excited about something, so are they. I need to find JOY in my job as teacher. Without it, I am like the teacher sighing in the squeaky swivel chair. Just wishing and praying for the day to be over. My kids deserve better than that. I try to evaluate things through this lens. Yes, even curriculum. Is it good, is it praiseworthy, is it virtuous…. does it cause me to honor God with my thoughts about it, or am I muttering, and groaning, and wishing I didn’t have to use it. Does it fit into the day well, or stress us out to get it done? We do the same thing with our Extra Curricular activities….. Sometimes those are a contributor to burning out more than anything. Always rushing place to place, can be stressful!!! What? I am supposed to have a schedule? I am blog cruising again. I fell off the boat…but now I am back! I tried!!!!!!! really I did!!!!!! ( yes I am whining…. can you hear it?) When we first started homeschooling, a ridiculously long time ago…. we followed the more traditional time line and school year…. I was working and my mom was the supervisor of school work on the days I had to work. I was working for a school district at the time, and it really just worked out well for everyone. Now, that I do not work outside the house, we have a very loose schedule. This currently works better than the traditional schedule, because we have visitation schedules with the oldest two, and with the distance that their father lives, it is easier to have longer visits. So they will take time to go and visit in September for a month, or extend their Christmas or Thanksgiving visit…. this flexibility is vital to them being able to stay connected. Our “schedule” has also been affected by terminal illness. We took off a large chunk of book learning time to compassionately care for their Papa as he died from Cancer. I would like to follow a more traditional schedule during each day, but that doesn’t seem to happen either. Some days, growing bodies need more sleep, so I let them sleep. The work gets done, whether it is in the morning, or the evening. I used to beat myself up for not following the traditional schedule. I am over that now, I realize, my kids are learning, growing, thriving…. and excelling in things, and our schedule allows for them to experience things that other children don’t. Sometimes the bigger kids don’t think it is fair because they don’t get the same days off as their friends do. I just remind them that their friends don’t get to take a month off, or travel to the places we go during the school year. We start a new term… or school year around the end of August- first of Sept. While they are gone I work really steadily with Hunter, getting in a good start on the year. Then come Thanksgiving and Christmas. This is a busy time of year. So here we are flexible! There are often rehearsals for programs, people come and visit, or we may travel… so we just grab so books to read and go. January is the start of calm…. And that’s it. It doesn’t look like the printed calendar down at the school district office, but it works for us. Don’t forget to stop by other Blog Cruise posts and see how other people organize their school year. It is that time of the week again…. I know you expect me to say, cruise time…. but really what I was going to say is… confession time. Today… we are going to keep it real. I am going to expose, worldwide, a hideous disease that lurks in my house. admitting it is the first step to recovery…. isn’t it? We are all friends here….. at least I would like to think so….. please don’t hate me because I am disorganized! I will tell you, when I read this question a few weeks ago…. I started to get hives. Really? 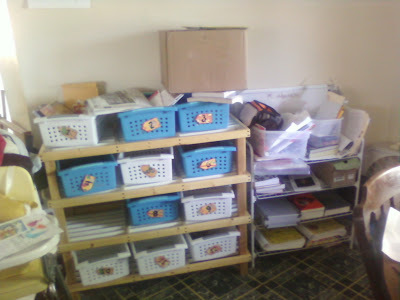 I am supposed to come up with some great way that I organize our homeschool? As I looked over my shoulder to the homeschool area in the kitchen….. I figured I should just let a picture speak a thousand words, and let you know how real life looks over here. The missing workbox is over by the couch with books in it for when we read in the afternoon…. oh wow… that is a mess and it looks even worse… posted here…. I will, however, resist my overwhelming urge for self preservation, and leave it up. Hopefully, it will encourage someone else. Maybe, they will see that homeschooling doesn’t require perfect organization. I write things down in my day timer, rather religiously. This keeps track of appointments, field trips, large assignments that are due. I have created email forms, for the highschoolers, to fill out when they have completed assignments. I can add paragraph boxes so they can answer essay style, and all of the information is collected in a spreadsheet for my easy tracking. One look and I know who has done what assignment. They just open up their email, and enter in what they have done. I still have a toddler, I structure the day so that most of the intensive one on one, or out loud reading for the 3rd grader is done during nap time. Cruise Time….. maybe one day I will be able to get on a real cruise boat, and not just cruise from my office chair in the kitchen……… ahhhh, someday….. I remember when I first started homeschooling, I didn’t know what a Nature Study even was. (I figure there are people out there that don’t know either, so I will start at the beginning…) I didn’t understand what the big deal about them was. They didn’t do a subject called “nature” in Public School…. I wondered if it was really even something to be worried about. Over time, listening, and researching this thing that kept popping up on message boards, and in forums, I finally checked out the Handbook of Nature Study by Anna Botsford Comstock., from my library. (beware… it is a BIG, I mean BIG THICK book…. it was sort of scary lookin’. I like the online version better, it is less frightening.) That is when I got it. Nature Study could be defined as the Art of Observation. What you are really doing, is teaching your child how to actually SEE the world around them. It is a stop and smell the roses sort of class. Armed with that information…. that the teaching of a Nature Study doesn’t have to follow a set of rules, and seeing how it integrates itself into all areas of study, I was eager to start this new “class”. Now to the part you have all been waiting for…. How we do Nature Studies where we live. I live in a mixed community. We are definitely a city, but at the same time, desperately clinging to our agrarian roots. It is common to see a house with a barn, horses, chickens, goats, or even the wild turkey roaming on a fairly busy main street. Our opportunities may be more varied than someone from a major city, where tall cement prevails over tree dotted hills. The biggest thing that we do for Nature Study time, is GET OUT OF THE HOUSE!… I know, sounds hard doesn’t it? We will go for walks along the river, we will talk about why the sparrows all build their nest on one side of the bridge and not the other. We look at bugs. We pick up leaves and try to classify if it is a monocot or a dicot. We pick flowers in the yard and we bring them in and cut them up. We identify all the parts of the flower. We pick up rocks and see what lives under there. We hunt for snakes. We watch the crows in our pine tree, and look for their nest every year. We investigate why the birds at daddy’s office only live under the roof tiles on one side of the building and not the other……. We care for our pets, the rats, the dogs and the cat…. and we watch the things they do. For larger animals, we have friends that have a farm. We have helped with chickens, goats, pigs, and now cows…. we learn about the animal and their differences by being around them. We can observe the differences in feathers from a chick to a full grow chicken. We have seen every size and color of egg. We learn why eggs start out small, and how long it takes for it to get to a regular egg size. We learned about the protective coating chickens have on their eggs naturally. We learned why chicken cluck after they lay an egg…. ( it is so you will notice them and not their cute new egg…). We have killed, plucked and eaten our fair share of extra roosters… We have bottle fed baby goats, watched their horns and hooves grow. We have felt the change if their soft baby fur to the more coarse adult fur. We have milked a cow. We have helped load pigs to take to the butcher. Those are some of the things that we do when the weather is good. Around here it can get COLD and it does snow…. So what do we do then…. is pretty much the same as in the summer, it just requires heavy coats, gloves and hats. We get out of the house!… When we have had a snow, we look around and see how the snow fell. We ask questions like…Why did the snow fall here and not there? Why did it pile up in this corner? What in the world causes this poky ice on our fence? Is the ground frozen? How do we know? Another way we study nature is to grow a garden. We learn about seeds, soil, decomposition, insects, all sorts of stuff. Nature Studies aren’t hard to find…. you need only open your eyes and ask questions. So don’t be afraid of the name, or worried you might not be doing it ‘right’, just go out and look at the big wide world around you, and see what you can see. If you want to read about how other homeschoolers study the world around them; click on the big cruise ship at the top of the post! Me or not to Me….. that is the question….. The first thing I thought when I read the first question was: ” I lock myself in the bathroom…” Humorous as that my sound… it is true…. there are times when I need to listen to a important call, or relax in the tub while they are in bed….. and I do.. I lock myself in there…. Let me start off by saying these are loaded questions, especially within the homeschool community. I am teased by public school mom’s about not know what free time is…..and that’s OK, I don’t want their kind of free time. Would life be ‘easier’ if I didn’t have to answer 50 million questions a day? Would life be simpler & all my bills paid on time, not to mention, my house would be cleaner if I didn’t have a crew of 4 here all day to mess it up? I am sure in the eyes of some it would be easier…. but for me the trade off on what I would have to re-teach my children at the end of a day…. Well, lets just say I have given up on having a home that looks like a Pottery Barn catalog….and for me the lack of free time that comes with homeschooling is worth it. Now does this mean I never have any time to myself? EVER? That I live in constant chaos, and always surrounded by needy, whimpering, clingy children? Nope…. not at all. I like to start the day out in the quiet of the morning… Just me, a cup of coffee, and the Lord. This is the most valuable “me” time I can get in a day. When I miss this time, I know it. My day just isn’t set right, but with it…. I am a much more patient, kinder, gentler, gracious mommy. Matthew 11:38 says: ” Come to Me, all you who labor and are heavy laden, and I will give you rest.” This explains every mom, since Eve…. and is the only way to find true rest. Rest without Christ, is just plain escape. I still think it is important to carve out time during a week in order to complete tasks that do not require constant interruptions… ie… time with your husband, bill paying, journaling, previewing reading material for your family, knitting or sewing, other household tasks or chores. I choose to do many of those tasks while the house is quiet in the morning or evening, or at nap times…. Sometimes, when there is more energy than my home and yard can handle, I will take them to the park and let them RUN!… Usually during those times, I take a book I need to read for the bigger kids work, or perhaps pay a few bills ( I keep them all in my day timer, so they aren’t getting lost! )… often I just have my Bible, and I will take the time to read a few more things from God’s Word. I remember when my older two were little… 1 1/2- 2 1/2 up through about 4…. My favorite ‘escape’ was Mc Donalds. I had a husband that traveled for weeks at a time, and I would work nights, and have the kids all day. They weren’t old enough for formal school, and being housebound with them would wear me down. My ‘escape’ ( I call it that cuz it was…. I was frustrated, overwhelmed and lacked a Christ-like perspective) consisted of dinner or lunch at Mc Donalds…. and a book for mommy to read. I would feed them, and let them run. Meanwhile I would read my book, blissfully tuning out most of the ambient noise of the playland. I didn’t really leave refreshed…. I always had to carry them out kicking and screaming, one under each arm…. but I was able to be free of their needs and demands for a few hours. Even reading what I just wrote, it sounds so selfish. How irritated I would choose to be, because of my children…. wow. Now, two more kids later….. and with a heart that is desirous to glorify God….. I don’t need that sort of time anymore. I don’t need to run from my children, or just have some me time. I don’t think it is the kids who have changed… nor the things that they do…. they still whine, cling, and barf on me…. It is me who has changed. My perspective on mothering, and teaching, and training has grown to be more Christ-like. Really I think that is the key to it all. Is the time that you spend away from the distractions of your family, however that takes shape, honoring to God. If the answer to that is yes…. Then I think that is a wise use of time…. if the answer is no…. or if the reason that you need the alone time sounds selfish….. you might need to re-evaluate. Since this is an issue with many different opinions, please don’t forget to click on the big cruise ship (at the top of this post) and check out what other folk’s have to say on the subject…. the few I have read already are wonderful! When Family and Friends are Fickle…..
yes it is cruise time again!…. This is a topic that touches the lives of just about every homeschooling family. I think I can safely say that every person who has ever even brought up the subject of homeschooling to their family and friends has faced some dissension with their decision. I am blessed that in my extended family, there is support. There are still questions, that are asked, that are not asked of family members who choose public education….. and I patiently answer those questions. I find that the “proof is in the pudding”, when it comes to defending your position to homeschool. I have many people say how impressed they are with our children, how polite, how well mannered they are. Many times we receive comments about how they are able to converse respectfully with adults on a variety of subjects, “they are so pleasant to be around” we often hear. Those are the comments I store in my memory banks, not as a yea me!, but as outside conformation that we made the right choice. In most cases we ignore it. Yup, you read that right…. we ignore it. We are not able to control what anyone else thinks or does. We can only control the thoughts and actions we produce. We chose to let love cover it, and ignore the comment. Most comments are made from lack of understanding, or from fear. If the person chooses to ask questions and seems to want more information, we will gladly, and kindly answer them. If not, we ignore it. Their words will not change our convictions….. so we just let it go. Regardless of the words……. we need to respond as Christ would. Did he offer many words in his defense, before they took him to the cross? I can not react in anger, and tell them off and let them know just how wrong THEY are….. no, the Bible says my words are to be full of grace….. and telling them off, would not be very edifying. This passage goes on to say that I am to be tenderhearted, forgiving…. because Christ forgave me. It is hard to stand ready to forgive someone who has hurt you with words, but it is what we are called to do as followers of Christ. Above all, we should pray for those that may not agree with our decision to homeschool. Don’t pray that God will change them and their point of view to agree with yours, but that God will help you to love them, and be quick to forgive their hurtful words. Don’t forget to click on the big Cruise Ship to see what other homeschoolers have to say on this subject! It is Cruise day again. I really like having these topics to write about. It gets my brain thinking about something besides lunch and dinner preparations…..
Today’s Cruise topic is ” How do you afford to homeschool? What are some of the ways to save money on homeschool supplies?” Let’s take them one at a time shall we?……. How do I afford to homeschool? Homeschooling isn’t as expensive as one would think. Yes, it can be pricey if you use a DVD curriculum, or other boxed options…. but if you compare it to the cost of tuition at a private educational institution, it is still a more economic option. When I am organizing a term’s worth of work, I always have my library screen up too. My library allows me to reserve books online, and will hold wish lists for me, so I don’t need spend extra time looking up books every term. I can enter the ones I need, and when they come up on the schedule, reserve them. We order books on CD, videos that correlate to a subject we are studying, foreign language videos and audio CD’s. It is the first place I start, before I buy anything! There are books we buy. We can’t get around it. There is no substitute for a well rounded library, and the ability to take your studies away from the computer and read. I usually purchase these books as they are needed……… and I search every website I can to find a deal. ( By the way, if you know some I don’t, pass them on! ) I will search Amazon, Half. com, Overstock.com, The Old Schoolhouse Store…. anywhere to save the dollar. Shipping is what always kills ya on these places so find vendors that carry multiple books. It is worth it to pay a dollar more for a book if you can save 4 dollars on shipping. Also look for a text that might be one edition behind the newest one. Most subjects don’t change that drastically between editions, but saving $90.00 on a Physics text…. is a nice deal any way you slice it. We do not skimp on our Science and Math curriculum. It is pricey, but with 4 kids, I know I will eventually get my money’s worth out of that $184 Algebra book and the CD’s. One way we try to take the sting out of having to squeeze these big ticket books out of our budget is an envelope system. If I know I need to buy a book in August…. and it is going to cost $184.00. I budget it over the proceeding 10 months. If I put a $20 in that envelope every month… In August, I have my book and my shipping covered. I go deposit the $ and order the book. What are some ways that I save money on homeschool supplies? I make lots of things. I bought a laminator…. it changed my life. I cost maybe $25.00 at Wally World… and the sheets aren’t that expensive either. I have reusable resources that work with any dry erase pen. These are name cards, the ones they put on desks to tell kids where to sit. It is lined, allows for large writing practice, and makes writing out one’s spelling words a bit more enjoyable. I picked them up on sale at Office Depot for $3.00 for a pack of 30. This is a clock I copied from his math book, and glued to a large index card. He either writes the time, or puts the hands on the clock. Typed up a bunch of words, cut them, and laminated them. He sorts the words into the envelope. We use it to practice nouns, verbs, proper nouns, titles….. lots of grammar done this way. My State flash cards that are in progress. I copied a U.S. Map. Cut out each state. Wrote the particulars on the back. There is a wonderful resource at TOS Magazine’s Schoolhouse Store. They wrote a book called Dreams and Designs, that sells for $12.45, and it is FULL of money saving ideas. I highly recommend that you budget for it. These are just some of the ways we homeschool on a budget. If you have other ideas, I would love to have you share them in the comments. I am always looking for new ideas!